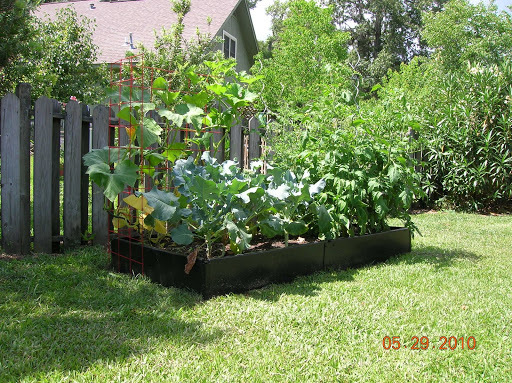 This is my first year doing a raised bed with a square-foot gardening mentality. I went small scale this year to see how things would go (and because I had a limited budget). Here it is. 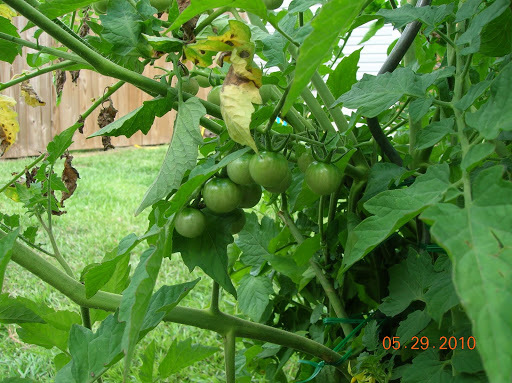 These are my tomatoes gone wild. 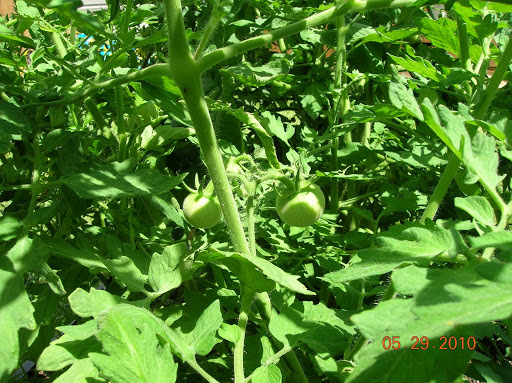 Normally, tomatoes should be spaced 2 to 3 feet apart. 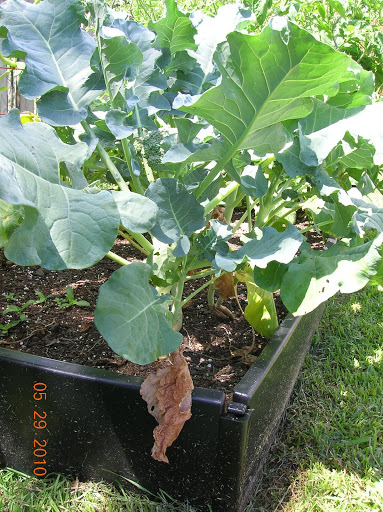 The square foot garden system I followed seemed to think you can squeeze something in between. There is a basil plant in there. Actually, there are two, but the second one is definitely not thriving. It’s hard to get sunlight when you have enormous tomato plants hovering over you. 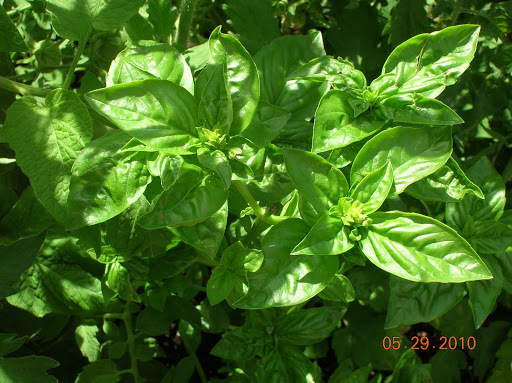 Here is the healthy basil plant. Well, it was healthy. When I saw it yesterday, one section was completely covered with an unidentifiable (by me) bug. I haven’t had the heart to check out the plant today. This plant was nearly defoliated for a dish for my party a few weeks ago, but it bounced right back. 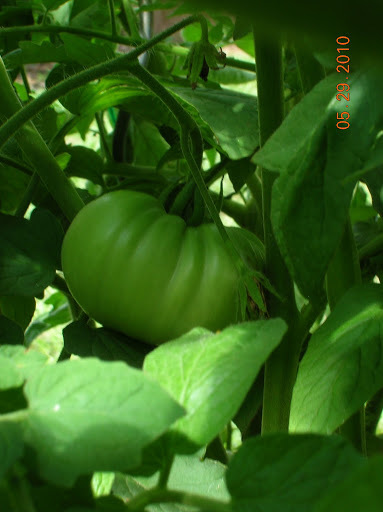 I have 4 different tomato varieties growing. I can’t remember exactly what I planted, but some are big and some are small. All are growing right now, so in another month, I’ll be seeing lots and lots of red. These cherry tomatoes might never make it to the inside of my house. They are so yummy warmed by the sun and straight off the vine. 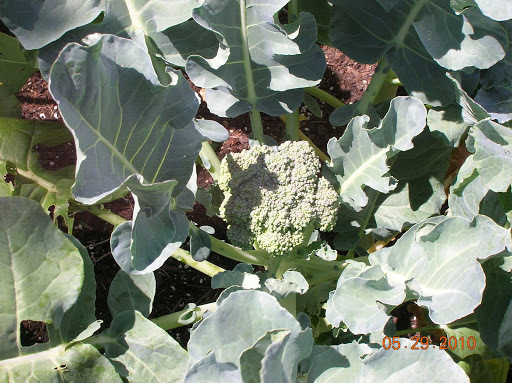 Having never grown broccoli, I had no idea what to expect from these large leafy things. I squealed with joy when I saw the florets sprouting from the tops the other day. They are for dinner tonight. 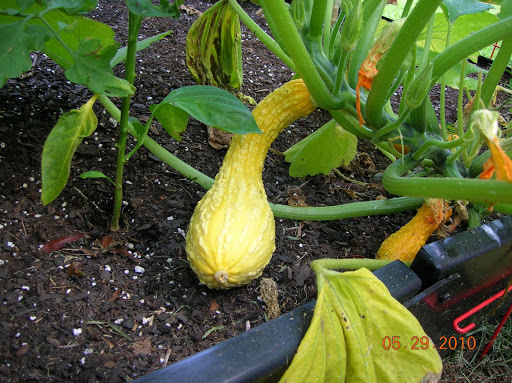 I harvested this crookneck squash the other day as well. 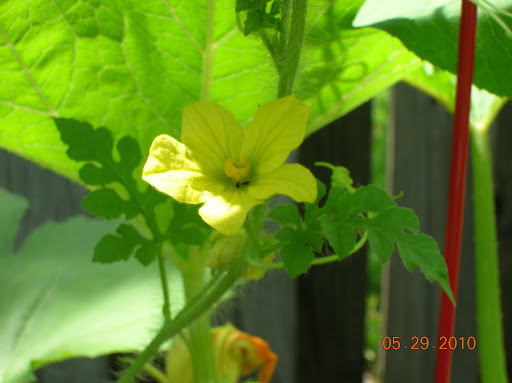 Lots of flowers on the pumpkin vine and I did finally notice a fruit growing. The last time I tried pumpkins, the bugs got most of them and a woodchuck finished what they left behind. Maybe this is the year for truly fresh pumpkin pie. I really think this is a watermelon vine and flower. 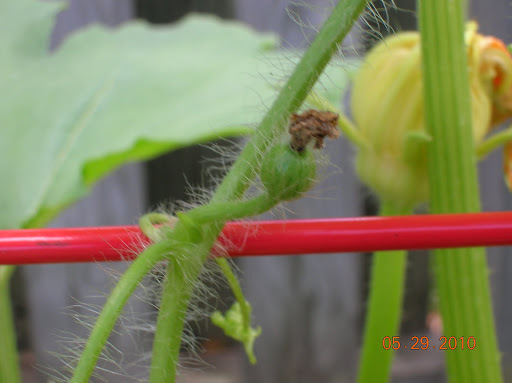 I thought it was dead and just looped it around the trellis and hoped for the best. I was very excited to see this tiny fruit last weekend, and I noticed one or two others yesterday. I’m still not confident the plant will survive; it’s such a straggly thing. We shall see. 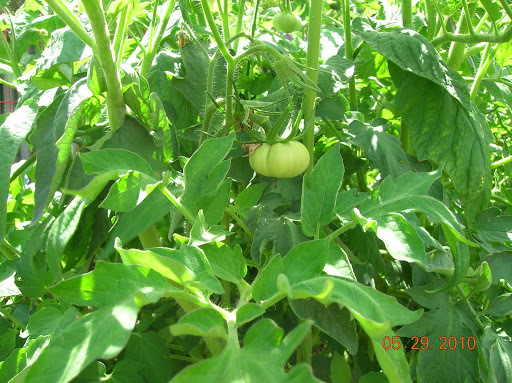 It is nice to have a garden, and nothing tastes better than your own grown vegetables. But I am very glad I can head to the local produce stand or grocery store for things my little bed fails to grow. Next year, I will definitely give the tomatoes more room. It looks lovely!!! 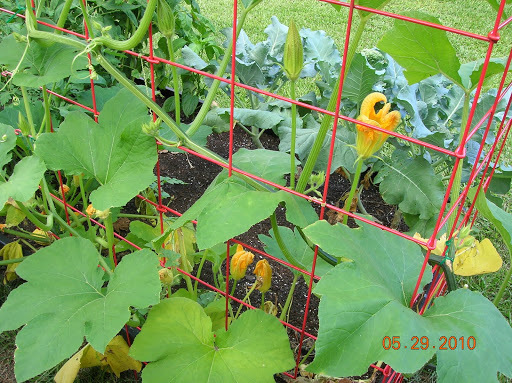 What did you use to keep your squash vine off the ground? That's where I'm failing, as I didn't use the pipe set up in SFG. 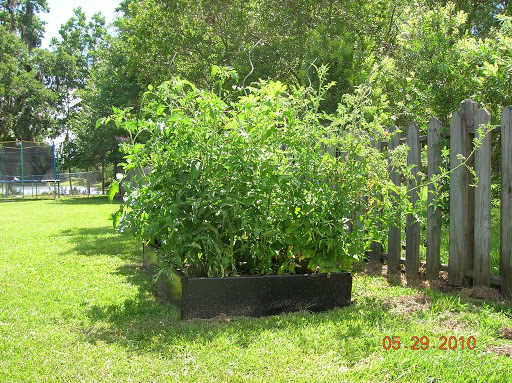 I have four boxes, and I space my tomatoes on per square foot, but surround it by smaller plants (marigolds, basil, jalepeno) — in other words, don't put the tomatoes next to each other. I also stake my tomatoes and cut back the extra foliage from time to time. Oh I wish my garden had done anything.. my sunflowers failed! !